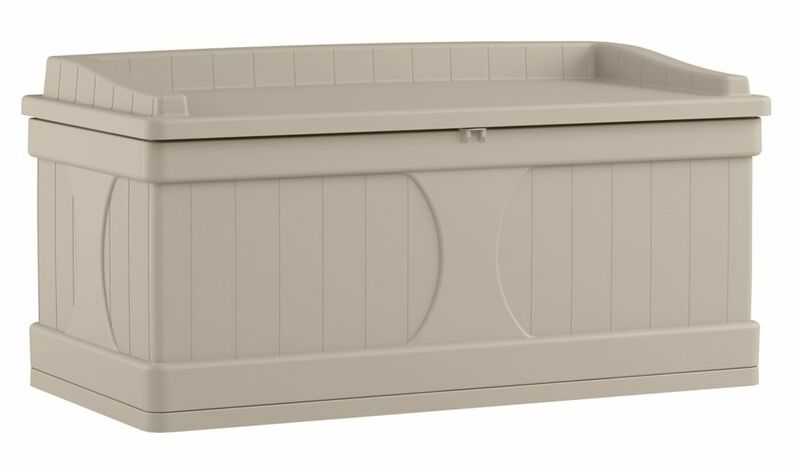 This Suncast 99 gallon deck box is great for storing outdoor accessories and furniture cushions. Easy to maintain, durable resin construction. 13.2 cu. ft. Resin Deck Box with Seat This Suncast 99 gallon deck box is great for storing outdoor accessories and furniture cushions. Easy to maintain, durable resin construction. 13.2 cu. ft. Resin Deck Box with Seat is rated 4.6 out of 5 by 12. Rated 5 out of 5 by HomeDepotCustomer from Easy to put together and very solid when assembled. Very... Easy to put together and very solid when assembled. Very sturdy and large storage unit that we are using for holding all our our deck furniture cushions. Rated 5 out of 5 by None from Assembly was simple and easy. They are light and easy... Assembly was simple and easy. They are light and easy to handle. Rated 5 out of 5 by Justme from I live in Central Florida, a few miles from the coast. I bought mine in 2005. It sits on my doc... I live in Central Florida, a few miles from the coast. I bought mine in 2005. It sits on my dock year round, I did screw it down through the bottom to the deck because of winds and storms. I had my first failure a few days ago, very high winds flipped the lid off. The straps will need to be replaced and I do not know if the hinge points are broken. My mistake was not making sure the padlock was secure, the lid would never have lifted. One thing I would suggest is give it a coat of UV resistant wax each year. Mine is now chalkey, but it is 13 years old so no complaints. Rated 5 out of 5 by MDiesel from As good as it gets. Big and sturdy.... As good as it gets. Big and sturdy. Rated 5 out of 5 by SueK from This is the perfect truck for the deck. We wanted... This is the perfect truck for the deck. We wanted one more bigger one so we went with the biggest. It is filled with all those things that need to be put away for winter & then some. I had it put together in 5 minutes. Very sturdy & looks great. Rated 4 out of 5 by Doreen from simple to put together. feels sturdy and you can sit... simple to put together. feels sturdy and you can sit on it without worrying about it falling apart. size is perfect for my needs (cushions on deck). i'm just waiting to see if it is truly waterproof otherwise i would have given it 5 stars.